At the very first beginning of the Symposium, the group was divided, and the tasks were assigned. 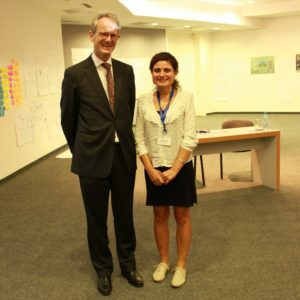 The mission: to design a roadmap for a transition in Colombia, Bosnia and Syria. ‘Coincidentally,’ I was assigned to work in the group that is working to design a good, but realistic, transition plan for Syria. As soon as we started, we realized that the list of the challenges is endless. The war in Syria is already complex and the intervention of the regional and international powers made it even more complicated. The outcome of the war is unknown. Many countries have a word to say about Syria and an opinion to give and a decision to make, but unfortunately, not the Syrians themselves. A couple of years ago, mentioning that Assad will remain in power was not acceptable. He is a war criminal and he should end up in The Hague. Over time, the international community showed that they won’t mind sitting at the table with a war criminal as long as he will serve their interests by maintaining stability and keeping refugees away. Today, the last day of the Symposium, we presented, in the presence of the Dutch Ambassador to Bosnia and Herzegovina, our vision on how the transition road map for Syria should be. In our plan we had to take in account all the challenges, and the biggest challenge in my opinion is that all indications are that the Assad will stay in power. We covered all area that should be addressed during a transition including: security, governance, justice and reconciliation. There is little that we can do in each of this domains without a political transition. Mr. Ambassador was pleased with our realistic approach, but I was not. As a Syrian this is not the transition that I am looking for, and I am sure that such plan without proper reconciliation will not lead to sustainable peace. And we can cannot expect a proper reconciliation without a political transition. The question is: will we see a political change in Syria anytime soon or we can rephrase the question to, “Will Russia allow a political change anytime soon?” If not, will we be able to prevent revenge or work on resilience without achieving accountability and justice?